After my work with BBC’s Skate Nation last year, I seem to be the BBC’s contact for all things skate related. My latest project was on the set on CBBC’s ‘Sadie J’, a Hannah Montana-esque teenage show with a bit more real life thrown in. 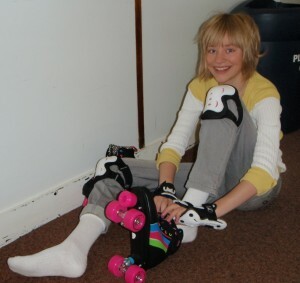 Sadie J’s character is played by Georgia, who on top of learning lines, rehearsing and having to study on set with tutors, now had to learn how to skate. Georgia had never skated before and we began with her colourful quads on the faded carpet of the office, where the high friction helped her get comfortable on her skates. We graduated to the corridor outside and around the corner the corridor strangely turned into a hospital corridor. I was in HolbyCity. Only the doorways off the standard issue hospital corridor went into TV admin offices, not theatres and wards. We skated up and down the HolbyCity corridors set for over an hour while Georgia continued to improve. She was amazed she had never skated before and how much fun it was. By the end of the session she was skating, stopping and negotiating doors and corners like a pro. She will in 10 days need to be good enough to waitress on skates on the set they have built as an American diner. Skating comfortably with trays of milkshakes is the next lesson! The lyno floor of the diner set is quite slow so her technique will have to be good for it to look smooth. Several more skate sessions with Georgia have been planned including a fun day for all the child actors, who have been working over their summer holidays and get few lie-ins. Georgia was most impressed by my quads skates earrings!